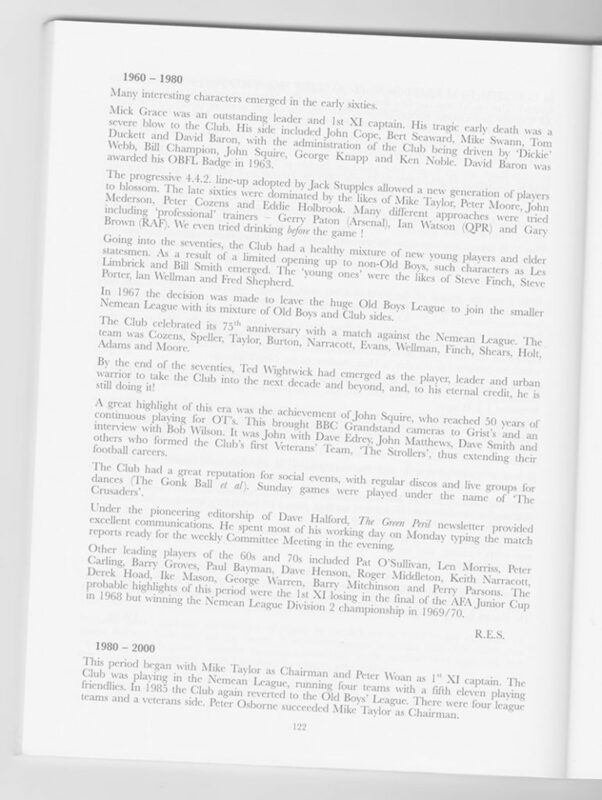 (We reproduce below the useful résumé of the Club’s history, researched and compiled by several stalwart members to mark the Club’s centenary celebrations in the Autumn of 2000). Tiffin School was founded in 1880. 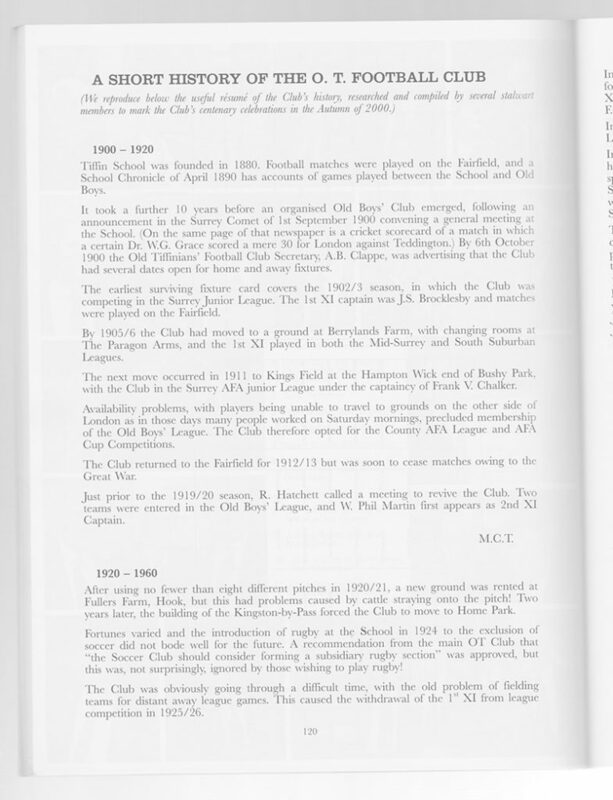 Football matches were played on the Fairfield, Kingston upon Thames, and a School Chronicle of April 1890 has accounts of games played between the School and Old Boys. It took a further 10 years before an organised Old Boys’ Club emerged, following an announcement in the Surrey Comet of 1st September 1900 convening a general meeting at the School. (On the same page of that newspaper is a cricket scorecard of a match in which a certain Dr. W.G. Grace scored a mere 30 for London against Teddington.) 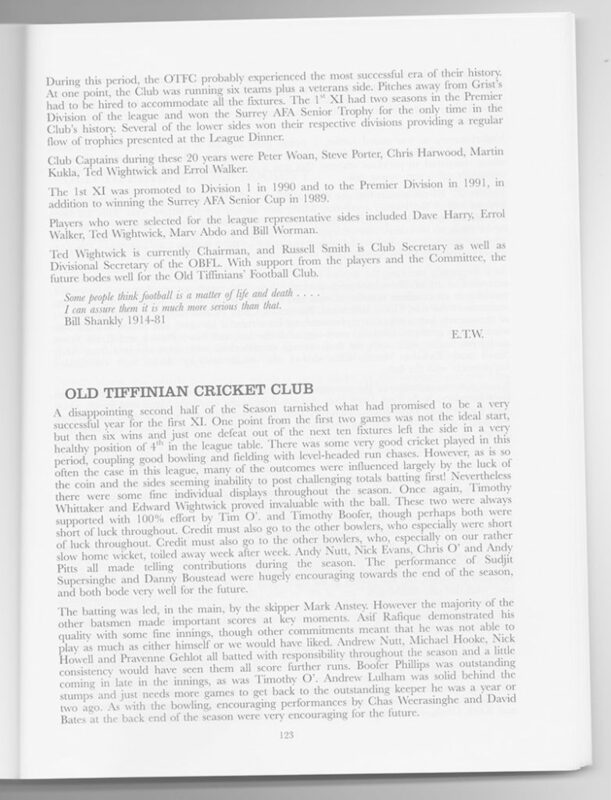 By 6th October 1900 the Old Tiffinians’ Football Club Secretary, A.B. Clappe, was advertising that the Club had several dates open for home and away fixtures. The earliest surviving fixture card covers the 1902/03 season, in which the Club was competing in the Surrey Junior League. The 1st XI captain was J.S. Brocklesby and matches were played on the Fairfield. By 1905/06 the Club had moved to a ground at Berrylands Farm, with changing rooms at The Paragon Arms, and the 1st XI played in both the Mid-Surrey and South Suburban Leagues. The next move occurred in 1911 to Kings Field at the Hampton Wick end of Bushy Park, with the Club in the Surrey AFA Junior League under the captaincy of Frank V. Chalker. 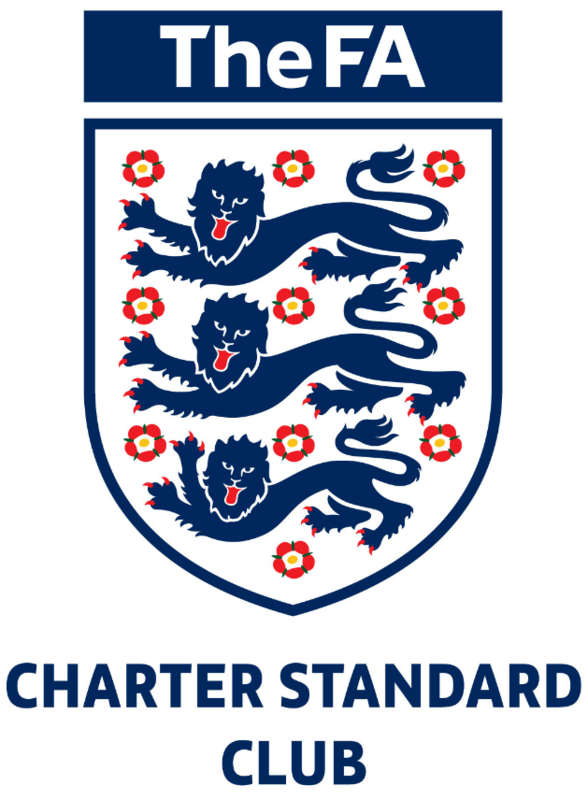 Availability problems, with players being unable to travel to grounds on the other side of London as in those days many people worked on Saturday mornings, precluded membership of the Old Boys’ League. The Club therefore opted for the County AFA League and AFA Cup Competitions. The Club returned to the Fairfield for 1912/13 but was soon to cease matches owing to the Great War. Just prior to the 1919/20 season, R. Hatchett called a meeting to revive the Club. Two teams were entered in the Old Boys’ League, and W. Phil Martin first appears as 2nd XI Captain. After using no fewer than eight different pitches in 1920/21, a new ground was rented at Fullers Farm, Hook, but this had problems caused by cattle straying onto the pitch! Two years later, the building of the Kingston-by-Pass forced the Club to move to Home Park. Fortunes varied and the introduction of rugby at the School in 1924 to the exclusion of soccer did not bode well for the future. A recommendation from the main OT Club that “the Soccer Club should consider forming a subsidiary rugby section” was approved, but this was, not surprisingly, ignored by those wishing to play rugby! The Club was obviously going through a difficult time, with the old problem of fielding teams for distant away league games. This caused the withdrawal of the 1st XI from league competition in 1925/26. In 1926/27 the 1st XI re-joined the Old Boys’ League ‘by special request’, and a 3rd XI was formed. The 1st XI won the Old Boys’ Junior Cup. Phil Martin was soon to take over as 1st XI Captain and George Knapp became Secretary, starting 42 years of service to the Club. F. R. Taylor chaired the committee throughout the 1920s. In those days, only former pupils were allowed to play for the clubs in the Old Boys’ League, and this rule was strictly enforced. In 1928 there was an Easter Tour based on the Isle of Wight. The first annual supper was held in the School Hall in 1931. In March 1935 the Headmaster, Mr. Dean, announced at a special meeting of the main OT Club that he would consider reintroducing soccer at the School. This saw the restart of competitive school soccer, which was to continue through the war years. Prior to the outbreak of World War II, the Old Boys were allowed the use of the School Field for home matches. The 1939 season was cut short by the war, but T. H. ‘Tubby’ Willis continued to run the clubrooms at Elmfield in the school grounds. The bar there became a very popular assembly point for OTs on leave. He also arranged an annual match against the school throughout the war years. 1946/47 saw the revival of the Football Club, with George Gladding as secretary and Bob Hanson as 1st XI skipper. 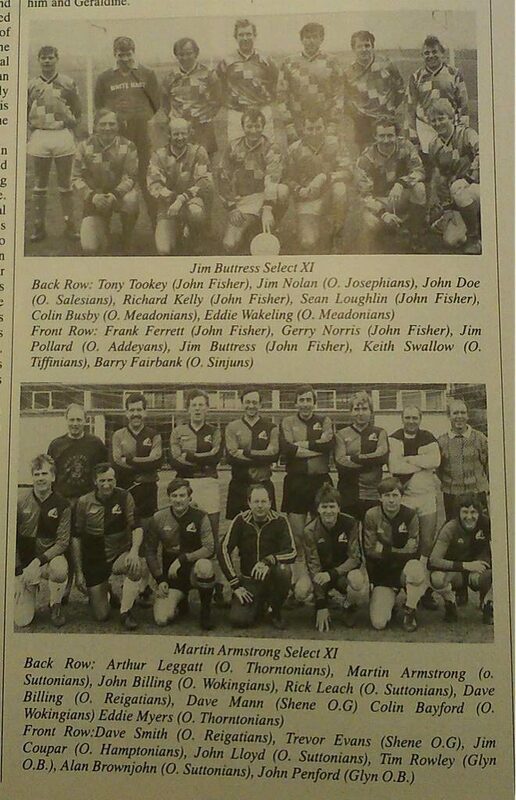 The following year a 3rd XI was fielded occasionally, but it was a year dominated by the 2nd XI, who won their division, reached the final of the Surrey AFA Junior Cup and won the London Old Boys’ Junior Cup. The minutes for 1947 record that John Squire agreed to take over as Team Secretary ‘until the end of the season’. In fact, he carried on this most difficult of tasks for a further 21 years! A remarkable record of service, which he continues to this day as Hon. Auditor of the Club’s accounts. On 16th October 1948 the first game was staged on the newly acquired Grist’s Memorial Ground at East Molesey. The kick off was performed by the President and Headmaster, Brigadier J. J. Harper. From initial very basic facilities a gradual improvement took place with the erection of four Nissen huts. It was very much an era of self-help, with painting and working parties being organised. Several masters at the School joined the Football Club, one of whom was Les Lewis, who was British 440 yards champion at the time. It was a convivial period, and the enlargement of the bar area helped us to gain a reputation as being one of the more hospitable clubs in the League. Following George Knapp, Bill Champion took over as Secretary in 1953/54 and held the position for the following 17 years – another record of exemplary service to the Club. He also served on the League Council for many years. During the fifties, the Club was not without its successes. The Reserves topped their division two years running, and the 1st XI won the newly formed Intermediate Division and the Surrey AFA Junior Cup in 1957. 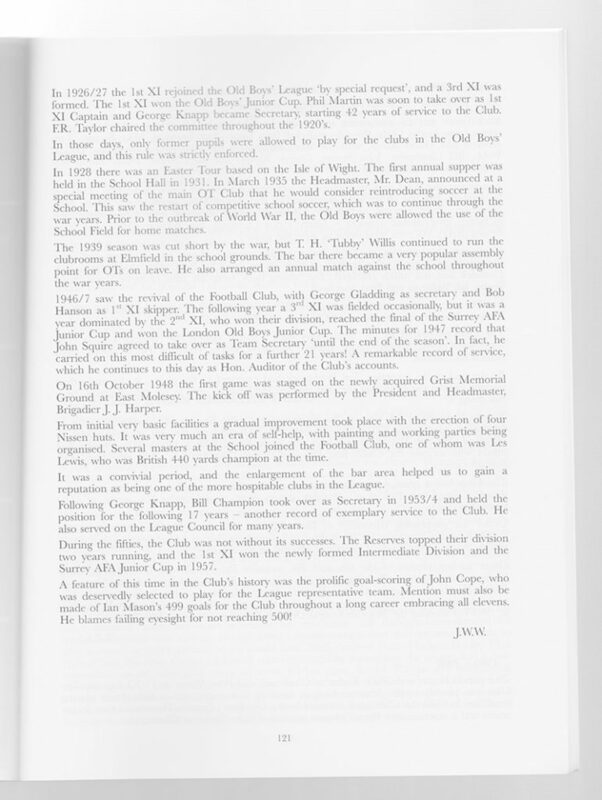 A feature of this time in the Club’s history was the prolific goal-scoring of John Cope, who was deservedly selected to play for the League representative team. 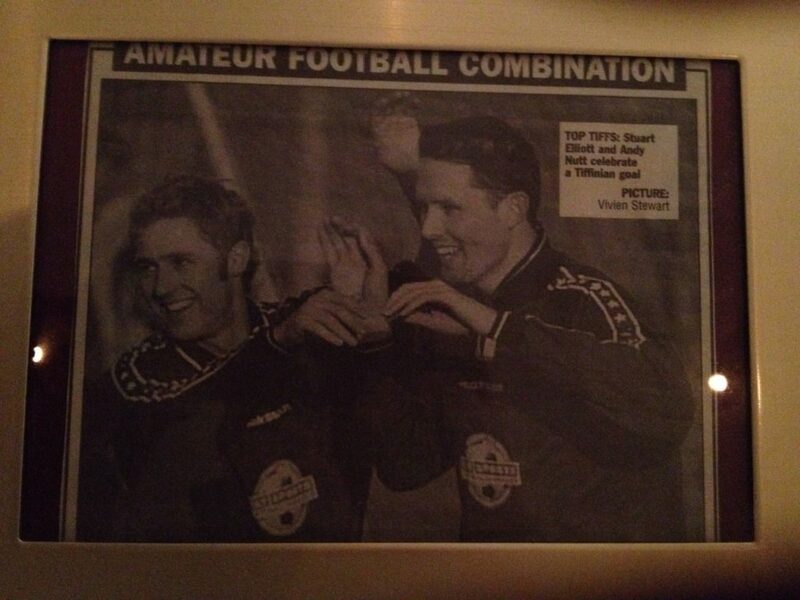 Mention must also be made of Ian Mason’s 499 goals for the Club throughout a long career embracing all elevens. He blames failing eyesight for not reaching 500! Many interesting characters emerged in the early sixties. Mick Grace was an outstanding leader and 1st XI captain. His tragic early death was a severe blow to the Club. His side included John Cope, Bert Seaward, Mike Swann, Tom Duckett and David Baron, with the administration of the Club being driven by ‘Dickie’ Webb, Bill Champion, John Squire, George Knapp and Ken Noble. David Baron was awarded his OBFL Badge in 1963. The progressive 4-4-2 line-up adopted by Jack Stupples allowed a new generation of players to blossom. The late sixties were dominated by the likes of Mike Taylor, Peter Moore, John Mederson, Peter Cozens and Eddie Holbrook. Many different approaches were tried including ‘professional’ trainers – Gerry Paton (Arsenal), Ian Watson (QPR) and Gary Brown (RAF). We even tried drinking before the game! Going into the seventies, the Club had a healthy mixture of new young players and elder statesmen. As a result of a limited opening up to non-Old Boys, such characters as Les Limbrick and Bill Smith emerged. The ‘young ones’ were the likes of Steve Finch, Steve Porter, Ian Wellman and Fred Shepherd. In 1967 the decision was made to leave the huge Old Boys’ League to join the smaller Nemean League with its mixture of Old Boys and Club sides. The Club celebrated its 75th anniversary with a match against the Nemean League. The team was Cozens, Speller, Taylor, Burton, Narracott, Evans, Wellman, Finch, Shears, Holt, Adams and Moore. By the end of the seventies, Ted Wightwick had emerged as the player, leader and urban warrior to take the Club into the next decade and beyond, and, to his eternal credit, he is still doing it! A great highlight of this era was the achievement of John Squire, who reached 50 years of continuous playing for OT’s. This brought BBC Grandstand cameras to Grist’s and an interview with Bob Wilson. It was John with Dave Edrey, John Matthews, Dave Smith and others who formed the Club’s first Veterans’ Team, ‘The Strollers’, thus extending their football careers. The Club had a great reputation for social events, with regular discos and live groups for dances (The Gonk Ball et al). Sunday games were played under the name of ‘The Crusaders’. Under the pioneering editorship of Dave Halford, The Green Peril newsletter provided excellent communications. He spent most of his working day on Monday typing the match reports ready for the weekly Committee Meeting in the evening. Other leading players of the 60s and 70s included Pat O’Sullivan, Len Morriss, Peter Carling, Barry Groves, Paul Bayman, Dave Henson, Roger Middleton, Keith Narracott, Derek Hoad, Ike Mason, George Warren, Barry Mitchinson and Perry Parsons. The probable highlights of this period were the 1st XI losing in the final of the AFA Junior Cup in 1968 but winning the Nemean League Division 2 championship in 1969/70. This period began with Mike Taylor as Chairman and Peter Woan as 1st XI captain. The Club was playing in the Nemean League, running four teams with a fifth eleven playing friendlies. 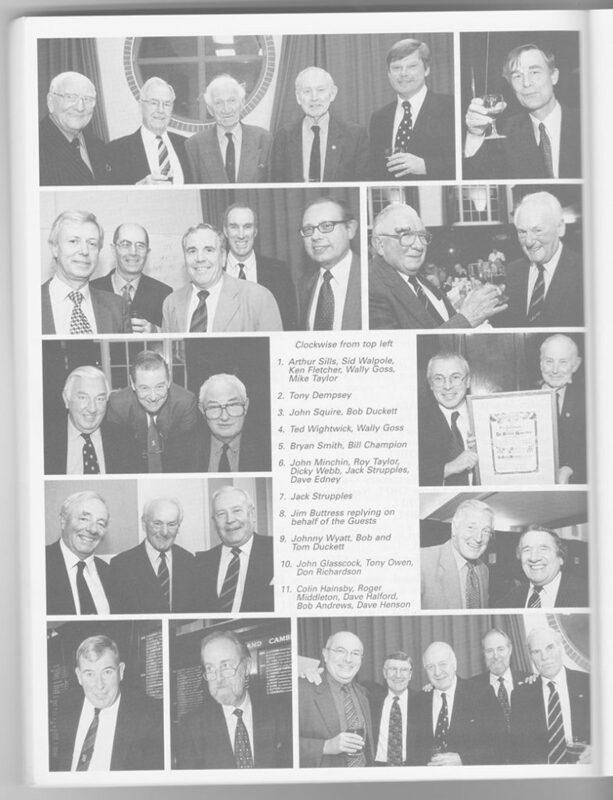 In 1985 the Club again reverted to the Old Boys’ League. There were four league teams and a Veterans’ side. Peter Osborne succeeded Mike Taylor as Chairman. 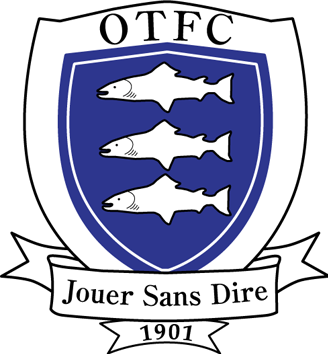 During this period, the OTFC probably experienced the most successful era of their history. At one point, the Club was running six teams plus a Veterans’ side. Pitches away from Grist’s had to be hired to accommodate all the fixtures. The 1st XI had two seasons in the Premier Division of the league and won the Surrey AFA Senior Trophy for the only time in the Club’s history. Several of the lower sides won their respective divisions providing a regular flow of trophies presented at the League Dinner. Club Captains during these 20 years were Peter Woan, Steve Porter, Chris Harwood, Martin Kukla, Ted Wightwick and Errol Walker. The 1st XI was promoted to Division 1 in 1990 and to the Premier Division in 1991, in addition to winning the Surrey AFA Senior Cup in 1989. Players who were selected for the league representative sides included Dave Harry, Errol Walker, Ted Wightwick, Marv Abdo and Bill Worman. Ted Wightwick is currently Chairman, and Russell Smith is Club Secretary as well as Divisional Secretary of the OBFL. With support from the players and the Committee, the future bodes well for the Old Tiffinians’ Football Club. 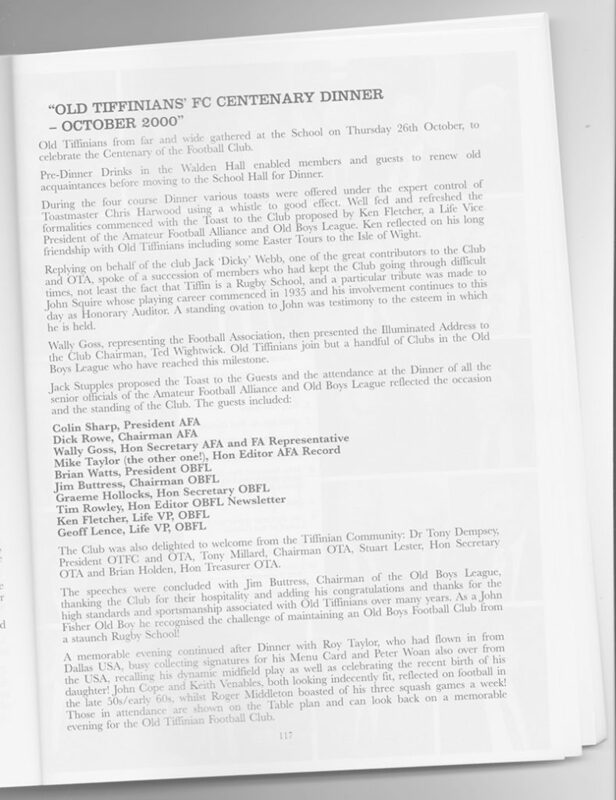 Old Tiffinians from far and wide gathered at the School on Thursday 26th October, 2000, to celebrate the Centenary of the Football Club. Pre-dinner drinks in the Walden Hall enabled members and guests to renew old acquaintances before moving to the School Hall for dinner. During the four course dinner various toasts were offered under the expert control of Toastmaster Chris Harwood using a whistle to good effect. Well-fed and refreshed the formalities commenced with the Toast to the Club proposed by Ken Fletcher, a Life Vice President of the Amateur Football Alliance and Old Boys League. Ken reflected on his long friendship with Old Tiffinians including some Easter Tours to the Isle of Wight. Replying on behalf of the club Jack ‘Dicky’ Webb, one of the great contributors to the Club and OTA, spoke of a succession of members who had kept the Club going through difficult times, not least the fact that Tiffin is a rugby school, and a particular tribute was made to John Squire whose playing career commenced in 1935 and his involvement continues to this day as Honorary Auditor. A standing ovation to John was testimony to the esteem in which he is held. Wally Goss, representing the Football Association, then presented the Illuminated Address to the Club Chairman, Ted Wightwick. 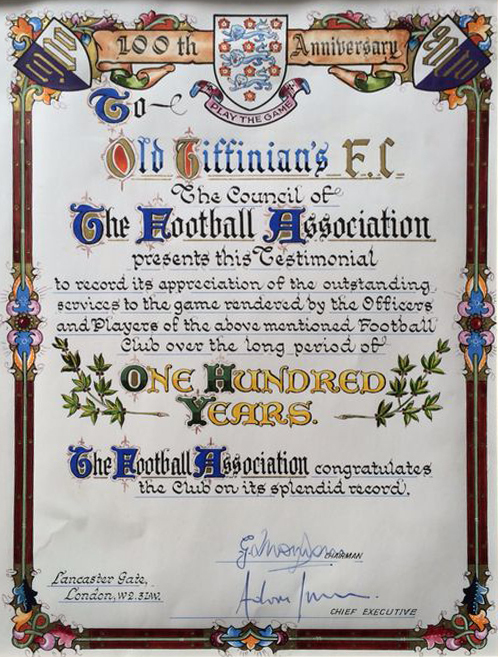 Old Tiffinians join but a handful of Clubs in the Old Boys League who have reached this milestone. The Club was also delighted to welcome from the Tiffinian Community: Dr Tony Dempsey, President OTFC and OTA, Tony Millard, Chairman OTA, Stuart Lester, Hon Secretary OTA and Brian Holden, Hon Treasurer OTA. The speeches were concluded with Jim Buttress, Chairman of the Old Boys League, thanking the Club for their hospitality and adding his congratulations and thanks for the high standards and sportsmanship associated with Old Tiffinians over many years. As a John Fisher Old Boy he recognised the challenge of maintaining an Old Boys Football Club from a staunch Rugby School! A memorable evening continued after dinner with Roy Taylor, who had flown in from Dallas USA, busy collecting signatures for his menu card and Peter Woan also over from the USA, recalling his dynamic midfield play as well as celebrating the recent birth of his daughter! John Cope and Keith Venables, both looking indecently fit, reflected on football in the late 50s/early 60s, whilst Roger Middleton boasted of his three squash games a week! Those in attendance are shown on the table plan and can look back on a memorable evening for the Old Tiffinians’ Football Club.